Next to the 10-gallon hat and the cowboy boot, there is no more widely recognized symbol of the Southwest than the giant saguaro cactus. And nowhere else in the region can you find more of these famous figures than Saguaro National Park, in the Sonoran Desert just outside of Tucson, Arizona. Saguaro National Park covers about 150 square miles of mountains and desert scrub in two locations, one east of the city and one west of it. In the decades since the saguaro forests first gained federal protection in 1933, Tucson has grown from a sleepy desert town to the second-largest city in Arizona—making this outdoor escape increasingly important. That’s why last month we were so proud to announce an expansion of Saguaro National Park. Thanks to a donation from conservationist Hansjörg Wyss, The Trust for Public Land added more than 280 acres along Rincon Creek, a wildlife corridor for species like Gila monsters and desert tortoise. The new addition to the park helps ensure that as Tucson grows, impacts like development and the spread of invasive buffelgrass can be kept at bay—for the benefit of the saguaros, the animals that rely on them, and the millions of people that draw inspiration from the beautiful Sonoran Desert every year. 1. First things first: it’s pronounced "suh-wahr-oh." 2. Like other desert plants, saguaros grow very slowly. But if conditions are right, they can become giants: the largest saguaro on record was nicknamed “the Grand One.” It was roughly 200 years old, 46 feet tall, and sported a dozen arms. This star saguaro was damaged in a wildfire in 2005, and toppled a few years later. 3. Despite providing the backdrop to old Westerns set everywhere from Colorado to Wyoming, giant saguaros grow naturally only in the northern reaches of the Sonoran Desert. 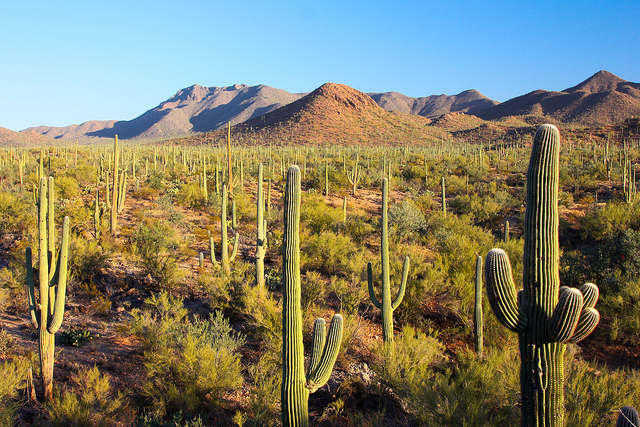 Saguaros like it hot, so they aren't typically found at elevations above 4,000 feet. 4. The saguaro is adapted to make the most of every drop of rain. The cactus has a single deep taproot—the rest of its roots grow close to the surface of the ground in order to absorb as much water as possible before it evaporates. Saguaros are supported by a ribbed, woody skeleton, which expands like an accordion to allow the plant to retain moisture. 5. It’s against the law in Arizona to harm a saguaro cactus: landowners need a special permit for any construction that will affect a living plant. 6. But these tough laws are no help against climate change, which threatens to make the northern Sonora Desert too hot and dry for even the saguaro. 7. The cactus is also at risk from introduced species like buffelgrass, which elevates the risk of wildfire and threatens to crowd out young saguaros. The National Park Service and local volunteer groups seek and destroy buffelgrass infestations by pulling up the plant from its roots by hand. 8. Saguaros sport a fleeting crown of blossoms in late spring and early summer. The blooms open at night and live through the following afternoon—a short window for pollinators like bees and bats to reach the pollen within. 9. After the blooms close, they mature into hefty red fruit—a sweet desert delicacy and an important source of nutrition for desert tribes like the Tohono O’Odham. For thousands of years, Tohono O’Odham people have harvested saguaro fruit using a long pole made of the plant’s woody ribs. 10. Dozens of animal species depend on the saguaro. Birds, bats, insects, lizards, and mammals feast on their fruit, flowers, and flesh. Birds of prey and even some ground-dwelling animals like bobcats roost (carefully!) in the spiny cacti’s arms. Gila woodpeckers and gilded flickers carve out nest cavities in mature plants, and when they move on, other birds—like pygmy owls—move in to raise their young. Got another cactus fact to share? Leave us a comment, or join us on Facebook! This is a wonderful, beautiful, interesting, fun site. I enjoy seeing new places, learning the history of our parks, both old and recently established ones. I may never get to them, but your presentations make them very real for me. Thanks Much! Thanks for the great article on the marvelous addition to Saguaro National Park. I live next to the Rincon Mountains, surrounded by these amazing cacti. Being situated on the top of a hill, I love watching the monsoon thunderstorms roll in; but, sadly, our two biggest saguaros were killed by lightning. We had a snowstorm & week-long freeze a few years ago during which the Park lost a number of "ancients". So, they're not invincible, and they MUST be protected. Please send me a map of the new boundaries of Saguaro National Park East. 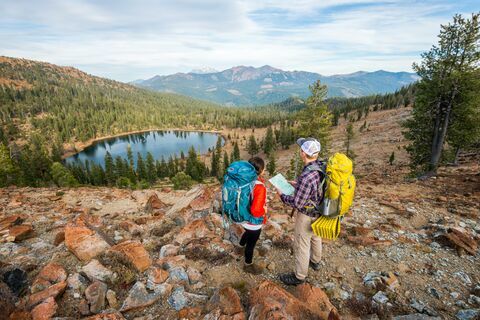 We love our park and support you all in protecting it! I live on a mountainside in Boulder City, Nevada. One of my neighbors has a beautiful, majestic, tall Saguaro in front of his house. It is at least forty years old. Our HOA is forcing him to cut this neighborhood icon to the level of the top of his house. The removed portion will be ten feet or more. He, his wife, and many in the neighborhood, are heartsick at the potential loss of this incredible, stately giant. We know that if it is cut, it will probably die. Is there nothing that can be done to save its life? If it could be transplanted, at least it would not be destroyed. Thank you. Is it illegal to collect cactus skeletons from land leased blm or trust land to a specific city ? Do I need a permit to collect cactus skeletons from gila,pinal or Maricopa county? WHO do I get one from.and map where they are ok to harvest with or without a permit. Not live ones of course.. I am 77 years old, and I have had this saguaro for 2 1/2 years. It is 47 inches tall. I would like to know what to look for as it grows and builds strength to hold the arms. Where and what it has to support the eventual arms. I won't life it it is 50 years old, so any insight you can give me would be appreciated. I lived in Arizona most of my life while I was young until I married and moved away. I hope you can help me and shed some light on my request.